Many small architecture firms start with one or even no clients, no money and a huge leap of faith. Maybe you started the same way. Does it seem like every step of running your business is guided by trial and error? Most small firm architects have no business training, no experience with business systems and frankly, are completely unprepared for what the future holds. If you say it out loud, that doesn’t sound like a formula for success. checklists designed and built specifically for small firm architects. Are you one of the hundreds of architects who already purchased? Download the documents here. 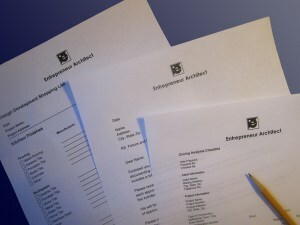 Take a tour of the EntreArchitect Foundations: Business Forms and Checklists package with Founder, Mark R. LePage. This collection includes documents for Business Administration, Design Development, Project Management, Construction Management, Sales and Project Organization. Whether you’ve just started a new firm or you’ve been in business for decades, these are the documents you need to make your business systems purr. Included with the package is the Pre-Design Client Questionnaire … FREE! This is the one document you need to gather information about the project, the client and all their hopes, wants and needs. It requests Love/Loathe Image Collections and provides an inventory of likes and dislikes using a matrix of 100+ descriptive words, revealing each client’s personal taste and style. It keeps the pre-design process fun while gathering all the information required for a successful project. You get all 50+ forms and checklists, including the Pre-Design Client Questionnaire, for only $97.00… that’s less than $2.00 per document. foundation for success. You cannot purchase a package like this anywhere else. All documents are prepared in a completely customizable Microsoft Office Template. Best of all, there is NO RISK. Your purchase is 100% guaranteed. If you are not satisfied, just send us an email within 30 days of purchase and we will refund your money. Click the BUY NOW button below and you’ll be on your way to savings and success. What Are Other Architects Saying About EntreArchitect Foundations? Download the Foundations Table of Contents and see what you’ll get. These free samples are in PDF format. The collection documents are fully functional MS Word and MS Excel Template formats.